Invisibility is one of those fantasies that would probably be a nightmare if it came true. Getting a feel for where you are in relation to everything else when you can’t see yourself would be hell enough, but even if you crack that conundrum, what’s to stop you from going mad with power once you realize you could do nearly anything you want without getting caught? Combined with the influence that whatever scientific means rendered you transparent might have on your mind, and this power could easily become more curse than blessing. 1933’s The Invisible Man made this loud and clear, and it’s a message that continued to be heard in its first sequel seven years later, The Invisible Man Returns. Though the franchise would soon take a turn for the ludicrous with a female-led comedic riff on the original H.G. Wells story (as well as a propaganda piece that sicced a see-through fellow on the Nazis), this film retains the seriousness of its predecessor while carving out its own identity. In fact, one could argue that The Invisible Man Returns is even more of a heartbreaker, as we come to see a good man’s gradual transformation into a monster rather than know him just as a maniac from the start. Geoffrey Radcliffe (Vincent Price) is in a terrible bind. As our tale opens, he stands convicted of killing his brother, mere hours away from his execution and with no reprieve in sight. His fiancé Helen (Nan Grey) knows he’s innocent, but with no evidence to prove it, her beloved’s fate is all but sealed — or is it? Hope lies in the form of a drug concocted by Dr. Frank Griffin (John Sutton), a solution that turns Geoffrey invisible and allows him to escape the hangman. The downside is that the potion has a nasty habit of eventually driving those who inject it insane…the same fate that befell Griffin’s brother when he experimented on it years before. It doesn’t take long for it to become clear that Geoffrey is heading down the very same path, as he becomes drunk on his newfound power and decides to use it to track down those who framed him. But when Griffin and Helen learn that he intends to exact deadly vengeance rather than see the guilty party behind bars, they must race to find a cure for Geoffrey’s condition before he goes irrevocably batty. While its predecessor had Claude Rains delivering a deranged, off-kilter performance pretty much from the word go, The Invisible Man Returns finds its impact in showing the progression of madness. Price’s Geoffrey still dives headfirst into lunacy fairly quickly, but that we see him in the beginning stages of having been injected with Griffin’s serum makes all the difference in helping us empathize with the guy. The affection he displays towards Helen and concern over losing himself to the drug’s side effects give the character a truly tragic bent, since we witness his mental well-being deteriorate instead of having the breakdown take place off screen. Geoffrey’s violent deeds aren’t quite as heinous as Jack Griffin’s (he keeps his revenge personal, as opposed to taking it out on innocents), but his corruption remains fearful all the same. Even with a sense of humor noticeably more lighthearted than the first movie’s (courtesy of the Cockneyest supporting actors you ever did see), the suspenseful moments mostly play as chillingly as they’re intended. Besides, if all else fails, the visual effects are still in damn good shape; yeah, they’re a touch crude by modern standards, but it’s impressive work anyway, as a couple well-placed shaking bushes are all it takes to convince you that Geoffrey is trampling through them. As with the original flick, The Invisible Man Returns features the eponymous marvel of science addressing us either as a disembodied voice or through that unforgettable ensemble of bandages. Rains made a doozy of an impression with his performance, but if anyone’s worthy of being deemed his successor, it’s the inimitable Vincent Price. In what’s considered to be his first fright film role (unless you count 1939’s Tower of London, which some would say falls under the category of “historical horror”), Price is just terrific, able to go back and forth from cackling madman to wounded victim with the greatest of ease. That you always understand where Geoffrey’s coming from — whether he’s calm and collected or has murder in mind — is a credit to the quality of Price’s acting, since he manages to make even the most melodramatic dialogue sound like poetry. The only trouble is that he’s so fantastic here, the rest of the cast can only dream of catching up to him. No one else’s role has the same bite, though that’s through no fault of the actors themselves; Grey (famously seen as one of Gloria Holden’s victims in Dracula’s Daughter) makes an appealing romantic partner, Cecil Kellaway has a lot of fun as an inspector hot on Geoffrey’s trail, and Alan Napier (Alfred from the ’60s “Batman” series) is memorable in a small part as one of the poor souls who faces Geoffrey’s wrath. Though more sentimental and less shocking than its predecessor, The Invisible Man Returns can confidently call itself a worthy sequel. The acting is in fine form, the special effects are terrific for their time, and the atmosphere is faithful to that of the original movie while putting its own spin on things. 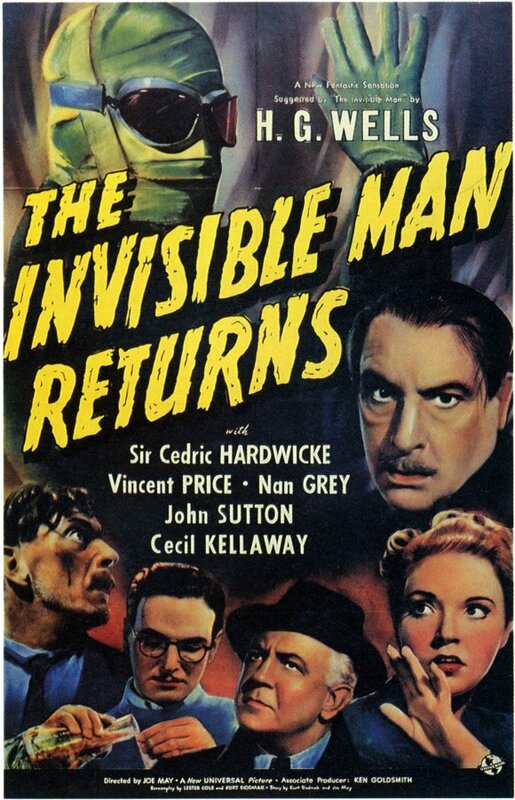 Be you a Vincent Price fan itching to see where he got his start in horror or a vintage genre junkie in general, The Invisible Man Returns is a spooky ol’ time through and through.